This cereal was described on the box as "puffed and toasted rice with brown cane sugar" with "oceans of energy". 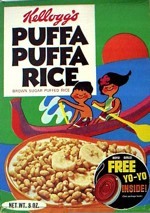 In its first years, the cereal was presented with a definite Hawaiian or Polynesian theme. 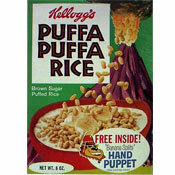 Island volcanoes, ocean scenes and palm fronds adorned various versions of the cereal box. When the cereal was first announced in ads, the announcer exclaimed "Nui! Nui! from Kellogg's" instead of "New! New!" 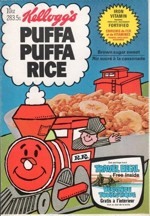 Around 1972, Kellogg's tried to promote the cereal with a smiling train having the title "Puffa Puffa Rice" puffing out of the trains steam engine. The cereal disappeared around 1975. These are the most recent images. Click here to see all pictures for Puffa Puffa Rice. What do you think of Puffa Puffa Rice? View all 157 comments for this cereal. 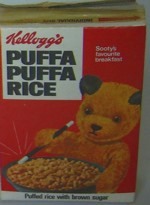 To northern soul: This was my all time favorite cereal. Re: your reference to top of the milk... I always made sure that I got up before my brothers, so that I could pour the top of the gold top, milk on it. 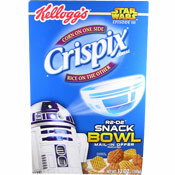 I stopped having breakfast when this was discontinued. My mum could never find a replacement so I never ate cereal for breakfast again. I was born in 1976 in the UK and I was eating this in the mid 80's so the wikipedia entry saying it was discontinued in 1975 is incorrect. In response to an earlier post... it's true that there was a blue hippo on the packet at the time, I'm just surprised that I can't find any evidence backing this up on line. 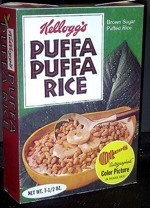 Puffa Puffa Rice has not been available (manufactured) in over thirty years maybe closer to 40. That response was ridiculous. The best cereal of all time. Didn't it feature a blue hippo character on a green box at some point? If Kellogg's brought this wonderful cereal back, the 'Sugar Police' would be on to them in no time! I love, love, loved this! Multigrain Cheerios remind me a little bit of them - but nothing matches! 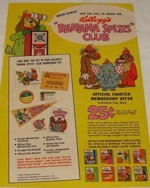 Kellogg's should bring this back. After all, they must still have the recipe in a vault somewhere. By Arnold.